Screenwriter William Goldman passed away last week. Although he’s not quite a household name, Goldman wrote the screenplays for classic Hollywood fare like Butch Cassidy and the Sundance Kid, All the Presidents Men, and The Princess Bride. As far as fright flicks go, he penned the scripts to movies like Magic and The Ghost and the Darkness, but his biggest contribution to horror history is this week’s subject. Yes, even though it means featuring Stephen King movies two weeks in a row (see The Dead Zone), we’re taking a look at Misery. 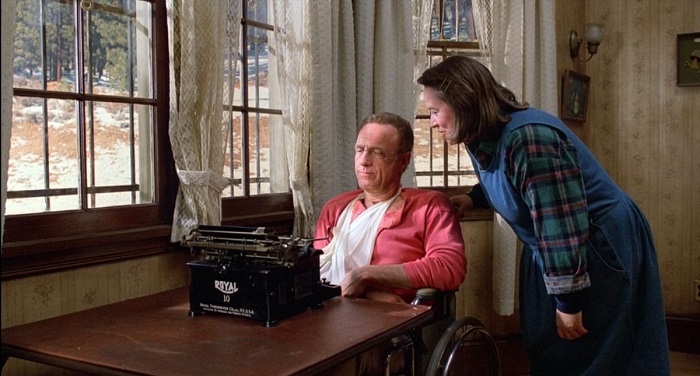 Misery is about a famous author named Paul Sheldon (James Caan from Rollerball and Lady in a Cage) who has just finished what he believes is his literary masterpiece. While driving down from his mountain cabin to deliver the manuscript to his editor, he gets caught in a freak snowstorm and wrecks his car. Lucky for him, he is saved by a fan named Annie Wilkes (Kathy Bates from Cheri, Fried Green Tomatoes) who is crazy about Paul’s series of books revolving around a character named “Misery.” Annie also happens to be a nurse, which is helpful, since the storm has them snowed in, and she can set Paul’s broken legs and take care of him until the thaw. While Paul is recuperating, Annie gets her hands on a copy of his newest Misery book – the final one in which the main character is killed off. Furious at his lack of respect for her favorite character, Annie holds the invalid Paul hostage in her home, forcing him to write Misery back to life. Paul quickly realizes that Annie is crazy and he is literally writing for his life, with his captor having no intention of letting him go until he satisfactorily finishes the story. 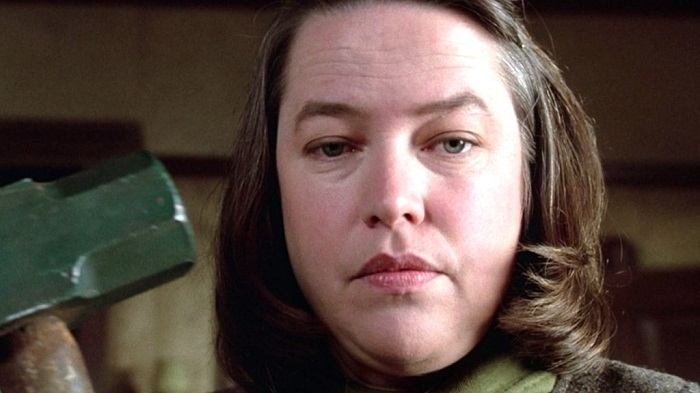 Misery was directed by Rob Reiner, who also adapted the King story “The Body” into Stand By Me a few years earlier (but will always be known in certain circles as “Meathead” from “All in the Family”). 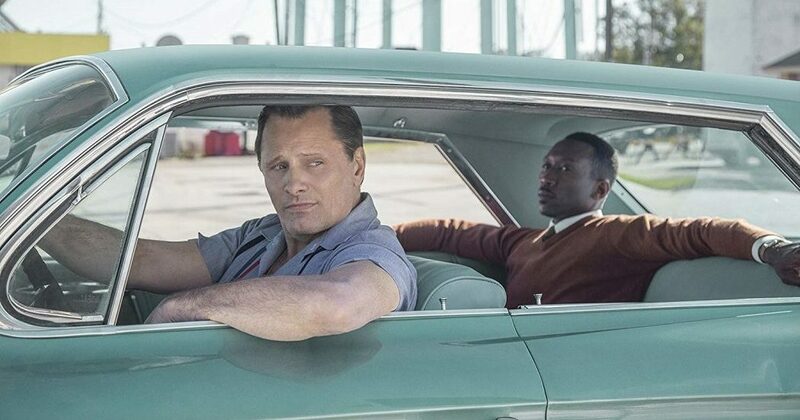 William Goldman’s masterful script sticks pretty close to the events of King’s book, minus the bits of Paul’s novel that are peppered throughout and plus the scenes that link Annie’s home to the outside world. Basically, Goldman and Reiner made the story more cinematic and theatrical, losing a bit of the claustrophobic aspect of the book, but adding exposition that otherwise couldn’t be shown on screen. 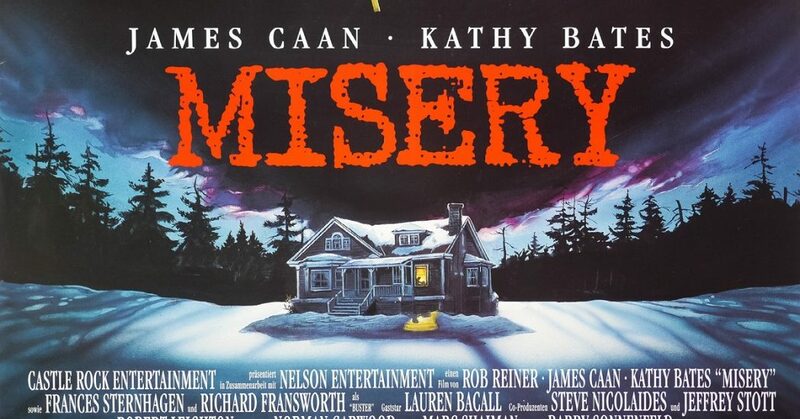 Of course, Misery is mostly a two-person show, and the one-two punch of Kathy Bates and James Caan carries the movie. 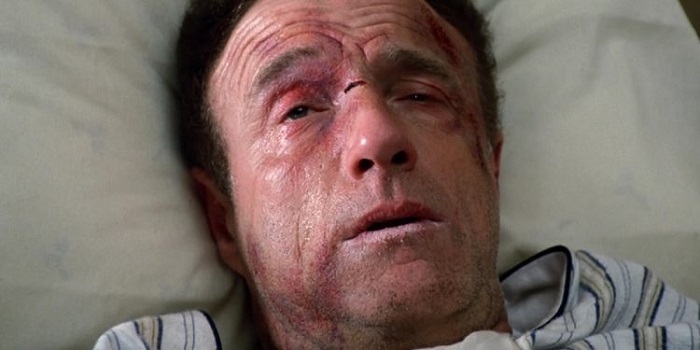 Caan plays a great victim, selling both the emotional and physical suffering of his character while still mustering up the courage and fortitude to fight back when he has to. And Bates is absolutely horrifying as the obsessed stalker, single-handedly bringing the phrase “I’m your number one fan” in to the pop culture lexicon. Annie Wilkes was literally a star-making role for Bates, earning her a well-deserved Academy Award and catapulting her from supporting actress to leading lady. Which brings us to the most legendary scene in Misery: the hobbling scene. When Paul starts healing up enough to be able to walk on his own, yet has not finished his work for Annie, she takes matters into her own hands and re-breaks his legs with a sledgehammer and a four-by-four board – hobbles him – so that he must stay and complete the task. It’s a classic scene with which even those who have not seen the movie are familiar, but there’s a certain Mandela Effect with it. The actual violence is shown, but it’s a fairly long shot that lasts for only about a single frame. Many viewers remember it as being a close-up that lingers for seconds. That’s probably a symptom of them having watched it through their fingers, cringing the whole time. It’s a terrifying scene but most of the brutality is in the viewer’s head, which is a huge testament to Rob Reiner’s filmmaking ability; what they imagine is worse than what actually shows up onscreen. The music for Misery was composed by Marc Shaiman, who did the score for serious cinema offerings like A Few Good Men and Ghosts of Mississippi, but also wrote the songs for South Park: Bigger, Longer & Uncut. It’s a somewhat minimalistic score, stinger-y and simple, working well with the wind and thunder – and silence – of the sound design, so that the whole thing becomes a subtle, shifting sonic soundscape. The music is there, but like the creaking cabin and the click-clack of the typewriter keys, it’s all just a part of the bigger picture. So far, Misery has not been remade like many other classic horror movies, although it was adapted into a surprisingly effective stage play (but not THAT surprisingly, since, like The Hateful Eight and The Evil Dead, its containment lends itself heartily to the theatre). 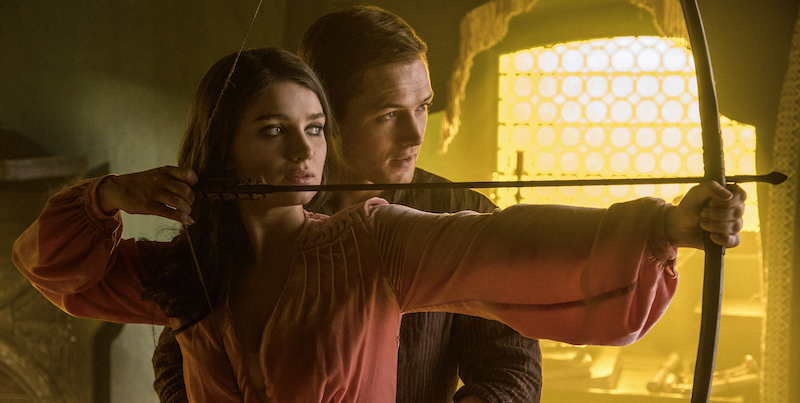 An update could be fascinating, especially with today’s climate of toxic fandom and the outspokenness of social media, but with William Goldman’s passing, someone else would have to write it. And because of that, it just wouldn’t be as good.